NOW LAUNCHED - ClearPoll is a decentralised public opinion poll network, using our own blockchain technology to secure votes and poll results. The problem ClearPoll solves is manipulation and censorship of real, genuine public opinion data. Currently, the media and corporations are able to fabricate poll results to suit their agenda. ClearPoll completely opens up the public opinion process, offering full transparency. Every single poll ever created is viewable and searchable. Users can vote on anything, any time, and create their own polls. Users earn POLL tokens as rewards for votes their polls receive, or for voting on sponsored polls. 50% of ClearPoll revenue is given back to the users, according to their monthly app usage performance. Users earn reward multipliers by holding POLL tokens! POLL was around 10-12c at ICO, which reached hard cap in October. It is now trading on Kucoin and Cryptopia (as well as some other DEX options). ATH has been just over $11 (x100) in January 2018. ClearPoll is a Perth, Australia based team comprising of experienced developers, designers and marketing specialists. Some key features include valuable market research tools, and "Star Polls" - a section where stars, celebrities and influencers can poll their followers, giving great exposure to ClearPoll. ClearPoll is already in alpha, in its most basic form, available on Android and iOS. It is a fully operational blockchain voting app, only lacking the features mentioned above. How do you plan to monetize? And you mentioned data being manipulated, but in an open platform such as yours, voting can be skewed towards majority opinion. Why not publish a proper Announcement with detailed concepts and business plan together with the specifications of your project? Many investors here are reading the ANN and decided to invest base on the informations feed by the Announcement. In a few different ways. Firstly we will be launching an advanced metrics subscription called ClearPoll Plus. This platform will give individuals or corporations access to all kinds of awesome analytics data on poll results, such as age, gender, location, votes by timeframe etc. This will be a valuable service for journalists, marketing companies etc. This service will be subscription based and paid for only with POLL tokens, creating a demand for the token as well as earning revenue for the company. The data will not be personal data, it will be cumulative data (just like Google Analytics etc). We will also be offering advertising space, which, as we know from our other apps, can be a very healthy revenue stream with a popular app. As well as that, we have merchandise sales. Poll-specific merchandise, allowing people to wear their poll results to prove their point that the people have spoken on a particular issue. Then we have ClearPoll Widgets, which would be free but have an advanced option to customise appearance plus have embed more detailed public data into articles or websites. Like all social platforms, we rely on a positive user experience. 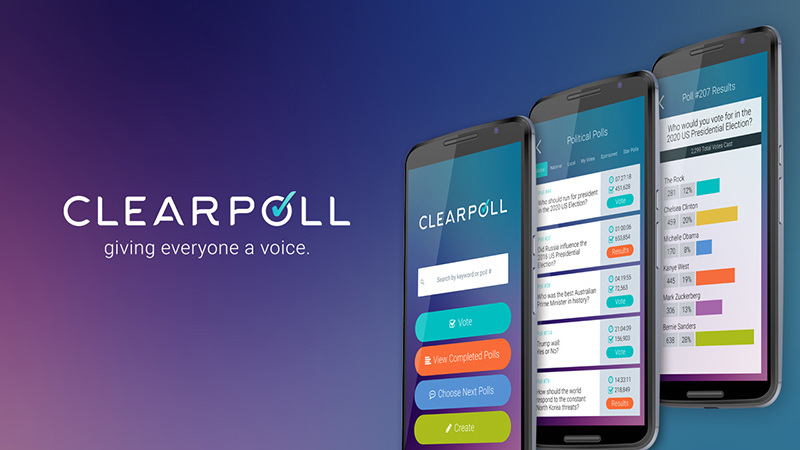 We believe ClearPoll will be the go-to place for people to have their say on important issues. Something that has been difficult to do in an unfiltered way on other platforms. Please check out the Whitepaper at https://www.clearpoll.io/downloads/ClearPoll-Whitepaper.pdf there is a lot of good info in there about how we plan to develop and expand this project. Can you be more specific about how voting can be skewed towards majority opinion? (or how that will be a problem for ClearPoll). ClearPoll is a platform for people to have their say. The majority aren't always "right" but it's still good to know what the current situation is on various topics. Voters will not be able to view poll results until they have voted, so they won't be tempted to just join the majority. Not sure if I have interpreted your question correctly? I like your concept but I cannot find road-map on your site or working demo concept. Do you have something working at this point or just the plain idea in paper? Hey all, just an update, we just added a raffle to our Pre-ICO and ICO. 1 ETH = 1 Entry. Winner takes all, 10,000 POLL tokens (3.33 ETH value). Will be drawn after all stages of the ICO are completed. Winner will have the bonus tokens sent to the same ETH address as the tokens they purchased. Previous contributors get automatic entries. UPDATE: ClearPoll is now accepting BTC during our Pre-ICO and ICO! Less than 24 hours before the max bonus stage ends. Do you have blog bounty campaign? Firstly thanks for your interest in ClearPoll, it has made a difference to us. NEO was around $18 when we first started to accept it for token sale contributions. It is now around $31. Which is awesome. We didn't expect this to happen during our ICO so we set a fixed rate. But it did happen, so now we can see we aren't offering a fair ratio. We have just changed it to 1 NEO = 275 POLL. Previously it was 170. We are always trying to be as fair as possible and look after our contributors because without you, we won't be able to produce ClearPoll to its full potential. All previous contributors will receive the 275 rate, and thanks again for your contributions! If NEO price falls again, we may adjust the rate back down but not for anyone who has already contributed. Same goes if NEO continues to climb. It's sad to see any news or updates. I invest during this Ico. Hey all, apologies for the lack of update here. We've been updating our other social media pages, Website news section and Telegram page every day. We've got some news! A working basic prototype video, showing multiple mobile accounts voting, blockchain interaction and live poll result updates. This is the core of how ClearPoll works, and it is working perfectly. We have also decided against using Hyperledger, and are creating our own blockchain instead, based on Ethereum. Token sale is still on, and we have increased the POLL/ETH ratio due to the price of ETH increasing lately. You can now get 2,500 POLL per ETH. That's under 12c per token, for a circulation of likely under 3M. We're looking for Alpha Testers! This is for the ClearPoll App, iOS and Android. Likely to be in alpha stage around February. Alpha testers will receive 100 POLL tokens each (limited places available, first 100 only). Hi I have been reading your whitepaper and I have 2 main doubts that are making me step back about your project. - How you will prevent people to vote more than 1 time? As I read you have to be registered as a User to vote with the App. But how to be sure this person is not using different users in the same App or in different Apps?. If you cant ensure people will be able to vote just once in each poll, I don't think governments, markets or journalist will find the App enough accurate to invest on it. Means ClearPoll will not succeed. - In the team I didn't saw any specialist or with bit of knowledge related with the main aim of the project: to offer transparent and accurate poll results. Without a person like that in the team or some proved external support information, is hard that entities will trust on the ClearPoll results so, again, they will not find the App enough accurate to invest on it. I hope there is a positive answer about this 2 concerns. And if not, I truly encourage ClearPoll to work in this 2 points to became totally reliable and useful to their main propose.